If you’re looking for a van conversion, Dave Arbogast Conversion Vans has the largest selection in the country. We offer van conversions from Explorer Vans, Regency Vans, Southern Comfort Vans, and many more van conversion. Unlike many other dealers we carry new van conversions and used van conversions. If the drive to Ohio is too far, no problem Dave Arbogast Conversion Van Depot will work everything out over the phone and email. We will deliver your new van conversion straight to your door step! Another option is to fly in and we will pick you up from the airport! Arbogast is located ten minutes from the Dayton International Airport. Our convenient location makes it easy to buy from anywhere in the USA. If you are interested in selling or trading-in your van conversion, visit our Van Conversion Trade-In appraisal page. 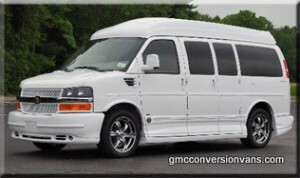 On this page you be able to accurately describe your van and submit it to one of our conversion van experts. We have appraisers on staff during all open hours and will make the process as quick and pain free as possible. Give us the opportunity to win your business. Feel free to give the experts at Dave Arbogast a call today, 1-888-436-3216. We are here to help answer all your questions and provide support in finding the perfect van conversion.